InterBase backup is similar to Firebird backup, as InterBase and Firebird are derivatives of one product line. InterBase is a widespread database management system that is at the moment developed and supported by CodeGear. A rich history of development made it very popular all over the world, and thats why Handy Backup supports InterBase backup. One of the main advantages of the InterBase DBMS is very small footprint and consumption of system resources. A full server installation requires only 40MB of disk space while the minimum client setup requires only 400KB. Automated InterBase backups. 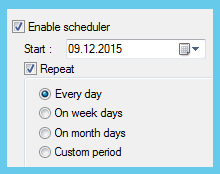 The flexible scheduler lets you automate all backup operations including compression, encryption and storing it on a desired media or server. Full or partial database backup. 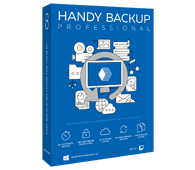 Handy Backup allows backing up all InterBase tables, or any specific tables you need. Run as Windows service. With this feature enabled, the program will be launched on computer startup and run invisibly in the background, not requiring you to perform any actions or log in. Multi-threaded transfer engine. The programs advanced architecture allows executing InterBase backup tasks without affecting your systems performance. For the InterBase backup instuctions, please refer to database backup section in the User Manual. The comfortable and capable user-level, one-machine solution that allows backing up InterBase and other data is called Professional. To perform server-based backup tasks, you need a bit more powerful Small Server edition. A variety of storage media. Includes local drives, NASes, FTP/SFTP/FTPS, private and commercial clouds etc. Backup to remote locations. 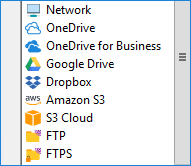 Choose from backup to FTP and backup to SFTP options, or use our Online Backup Service to achieve the maximum data safety. Little disk usage. The program itself is very small, and can use ZIP compression to minimize the usage of your disk space. E-mail notifications. The report about completed tasks or errors will be automatically sent to your e-mail. Handy Backup also allows you to backup and restore different types of databases such as MS SQL, MySQL, PostgreSQL, Oracle, MS Access, Lotus, DB2 and FoxPro. For more information about functionality of Handy Backup, read the full list of backup features of InterBase backup software. Handy Backup is an unreplaceable instrument when it comes to InterBase backup!